Eight members of the Visual Arts Department faculty at SUNY Old Westbury are being featured in an international exhibition of their work at Gallery R3, located at the University of Quebec Trois Rivières. Old Westbury, NY - October 1, 2015 - Eight members of the Visual Arts Department faculty at SUNY Old Westbury are being featured in an international exhibition of their work at Gallery R3, located at the University of Quebec Trois Rivières. The exhibit, “NYC, Inc.,” presents the work of Mac Adams, Fred Fleisher, Robert Gero, Helidon Gjergji, Chris Griffin, Patty Harris, Tricia McLaughlin, and Jennifer Sullivan. Each artist lives or works in the New York City area and each was invited to participate because of his or her strong history and connection with the city’s cultural and historical landscape. Professor Catherine Bernard, who served as curator of the exhibit, along with Fleisher, Gjergji, and McLaughlin were welcomed as guests to the University of Quebec Trois Rivières earlier this month to mark the opening of the exhibit. In its program for the event, Gallery R3 noted: “Each of these artists draw from New York artistic and cultural brew a sense of cutting edge, an acuity of the contemporary artistic context and include these, as well as information and materials the city provides them with, in works that are as diverse as New York cultural landscape.” The mediums and materials used in the exhibit range from graphite on paper, to photography and 3D digital work, painting, installation and video. Themes also are varied but one may be able to discern a reflective --at times dark-- undercurrent common to the different works, linked to an awareness of the current sociopolitical and historical contexts for which New York may appear to be a microcosm. The Visual Arts Department at SUNY Old Westbury offers undergraduate degrees in Visual Arts and Visual Arts: Electronic Media, including a program leading to a Bachelor of Fine Arts (B.F.A.). 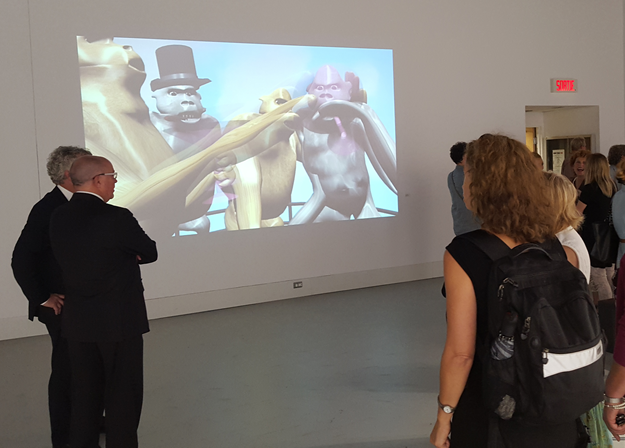 Pictured: Guests gather to view the work of Tricia McLaughlin, associate professor of Visual Arts at SUNY Old Westbury, during the "NYC, Inc." exhibition at R3 Gallery in Quebec, Canada. Subject: LongIsland.com - Your Name sent you Article details of "SUNY Old Westbury Visual Arts Faculty Featured in Canadian Gallery Exhibit"